I will start with the recognition that all our movements are to some extent governed by the central nervous system. I have previously discussed the idea that the brain is a “governor” on strength. For example, too much strength is a potential danger to the body, so the brain makes sure it is only used in a manner that is known to be safe. Because of this, any form of training that makes you stronger can be understood as a way of “convincing” the brain that more strength is a good idea. We can look at flexibility, or any movement away from neutral, in a very similar fashion. The further a joint moves away from neutral into an extended position, the less safe it is. When a joint is in neutral, the connective tissues that hold it in place are on slack and not in any danger of lengthening beyond their capacity. The joint surfaces are well aligned and capable of absorbing compressive forces. The muscles are in a mechanically advantageous position to create or prevent movements. All of these factors are reversed when the joint moves into an extended position. Thus, any movement of a joint away from neutral is inherently threatening to joint integrity. For example, extended ranges of motion that are safe at low speeds or forces can become dangerous when larger speeds and forces are applied. For example, while I may be able to easily stand with my feet wide apart, I would not want to land a jump in that position. Oh no. So any movement away from neutral carries an inherent threat, and it is reasonable to assume that the brain is constantly taking measures to prevent potential damage. How does the brain protect against the threat of movements made in extended positions? Four obvious measures would be: limiting flexibility or strength, altering movement patterns, or creating pain. These are all undesirable outcomes. With that in mind, it makes sense to look at the threat of extended movements from the perspective of the brain. This might help you answer the question of how you can convince the brain that a particular movement at an extended range of motion is safe. If I was my brain, and I thought that joint damage would significantly impair my chances of passing my DNA to future generations, I might consider the following before allowing my body to get funky at an end range of motion. First, I would want to be assured that any end range movements do not cause even the slightest hint of pain. This might be a clue that something very bad is about to happen. Second, I would be suspicious of movements that are not familiar. Unfamiliar movements are guilty until proven innocent by many safe repetitions. Third, I would fear movements that are not well coordinated. If balance is poor, if coordination is not there, if stuff happens I don’t expect, then that movement needs to be shut down. But If I can feel that a joint is well stabilized, moving accurately towards the target, and that the rest of the body is well-balanced and free to move for counterbalance and support, I’m going to interpret that as a safe situation. Finally, and perhaps most importantly, I would want to know that the joint is capable of returning to the neutral position with some power and speed. In other words, that the joint knows how to return to home base quickly. Based on these speculations, I might guess that my brain would be less threatened by end range movements that are familiar, coordinated, pain free and easily reversed back to a neutral position. And with that in mind I can develop a plan to train better movement at an end range of motion. Let’s take my squash lunge as an example. 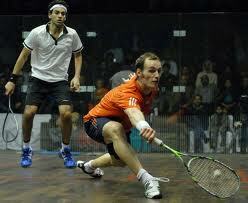 First I would slowly and carefully get into the extended lunge position where I want to hit balls. I will make sure I am as comfortable as possible to convince my brain that it is safe. Once there I will start to explore the position slowly and carefully to get familiar with it - to basically map out the whole area in as much detail as possible. For example, I could pay attention to how my hip feels if I shift my pelvis left or right, forward or back. I could ask the same questions about many other small movements in my foot, or chest, or shoulders, or head. Any movement of any other joint will have some impact on the comfort, stability or quality of the lunge, and the more my brain can become familiar with these subtleties, the better it will be able to build a clear “lunge map” that it can use to anticipate what may happen there. Then I could spend some time adding some speed and force to the movements, like swinging a racquet at speed. Then I could practice getting out of the lunge, or maybe show the brain through isometric contraction of the glutes or hamstrings that the extended muscles are capable of taking me back home. After some practice, the movement should be familiar, coordinated, pain free and reversible, and therefore doable without an overprotective brain getting in there and protecting me from ever reaching a squash ball. What about the many forms of stretching techniques that incorporate neurological “tricks”, such as PNF, contract/relax, post isometric relaxation, reciprocal inhibition, etc. In my opinion, these methods are essentially just ways to convince the nervous system that the movement is safe. For example, contracting the stretched muscle is way to show that the movement is reversible. Activating the antagonist to the stretched muscle is way to show that the movement is controlled. Other movements are a way to map the joint and get familiar in the position. What do you think? Is it foolish to anthropomorphize the CNS? Leave a comment below. And share the article if you liked it.